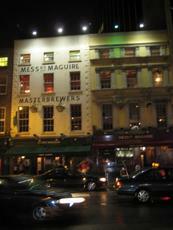 No longer known as Messrs Maguires (I think they went under), but still open. Several keg brews from White Gypsy available. 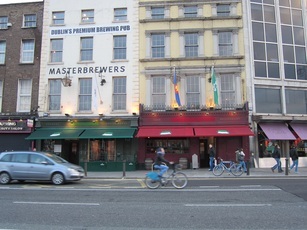 This pub sprawls over four floors in a building overlooking O'Connell Bridge. There are bars on the ground and first floor. The stairs to the upper floors were blocked on my visit. I sat at a window overlooking the river on the first floor. There are two impressive fireplaces with rooms at split level behind them. At bar level there is a seating area to the left of the bar with bookshelves adorning the walls. There are five beers brewed especially for the pub - Plain (Dublin Stout), Rusty (Irish Red Ale), Bock ('a malty Irish lager'), Haus ('a German-style premium beer') and Weiss. I had a pint of Plain which I didn't find to my taste. Having just come from The Porterhouse I had been hoping to find at least one hoppy 'golden' beer but as I was pushed for time I didn't get to try any of the other ales so I may have missed something good! However, it is good to see a pub in Dublin (see also The Porterhouse) attempting to educate people about beer and I shall pay a return visit in the future. Quite a dark, traditional interior with a high ceiling in the main bar area giving a slightly cool feel to the place. However, the main attraction is their own beers which include an excellent 'Plain' which is ten times more interesting than any pint of Guinness you'll have had. Went in at quite a quiet time, so couldn't help eavesdropping on three ladies of a certain age who had obviously had a very good lunch. With their stories about friends and relatives getting into trouble with other peoples's spouses, and anecdotes about dubious goings-on up north near the border, I could have stayed all afternoon. Well worth seeking out. Interesting multi-levelled pub. Micro beers were available but too cold....I ended up sticking with the gwince. Called-in earlier this month while visiting Dublin. Service was friendly and efficient and the Maguire 'Plain' was excellent and - by Dublin standards - keenly priced at �4 a pint. Kept going back for more!